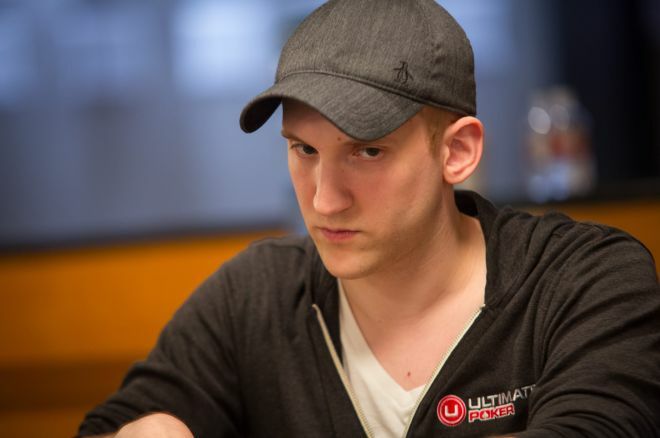 Does Jason Somerville Have What It Takes To Be the Next Daniel Negreanu? From the outside looking in, signing with a poker site looks to be the ultimate dream for a poker player. Once you sign a deal, the free buy-ins, flights around the world, magazine covers and inflated rakeback deals will all be yours simply for being good at a card game. But it’s not that simple, as Jason “JCarver” Somerville, a sponsored pro with US-facing site Ultimate Poker, can attest to. At 26, Somerville, who won a World Series of Poker gold bracelet in 2011, is fast approaching veteran status in the poker world. He’s seen the poker landscape he inhabits affected by both the Unlawful Internet Gambling Enforcement Act (UIGEA) and Black Friday. Due in part to those two milestones, we’re now in an age where poker sponsorships are as rare as a steak tartare, and as a white American male, Somerville doesn’t exactly stand out from the crowd when it comes to patch-bearing players. What Somerville has done in the six months since he signed and decided to move out to Las Vegas is truly staggering and puts most poker players' volume to shame. Ironically, though, he’s worked incredibly hard on everything apart from his poker. Not that he views that as a negative. “It’s been the best six months of my life,” he says. “Ever since I moved to Las Vegas, I’ve played zero hands of live poker and I’ve played under 100 hands of poker in any kind of serious fashion,” although the day after this conversation Somerville admits he’ll be playing his first big tournament since he blanked the 2013 WSOP. What’s more, the love he puts into the series has been reciprocated by the poker community. “It’s so great to have a platform like Run It Up where so many people just enjoy it,” he tells me. And Somerville’s view on what it means to be a sponsored pro has changed in the six months that he’s been associated with Ultimate Poker. “There’s so much more information that I didn’t really understand six months ago from a player’s perspective. But now that I’ve seen more of the world from all different angles, I understand a bit better as to the true challenges of the site and how I can really contribute. I think that a lot of poker players need to think from an operator’s point of view, 'What good do you do for them?'" Of course, some deals don’t work out as well as Somerville’s has for everyone. Hot on the heels of Black Friday came the troubles at Lock Poker and it’s often the pros, as the public face of a poker site, who find themselves in the line of fire when things go wrong, something Somerville thinks comes with the territory. “It’s not a one-way street, you know?” he says. “It’s not just a thing where you’re just like 'Oh! I’m going to sign with these guys and take their money, that’ll be great!' You’re kind of vouching a little bit for the site, especially if you’re not signing with the most major operator on the planet. I think that if you say 'Oh, well I had no idea there were any problems,' well that very well could be true, but what were you doing? I guess there are just 'wear a patch' deals and I don’t think those people should necessarily be held liable or anything like that, you know. It would be like holding a guy who was wearing a patch one time liable for Full Tilt Poker’s failures. But you know the guys at the top level, who are making the bigger amounts of money, the guys who are ambassadors for the brand, if you can’t at least logically be able to say, 'Well look, I talked to these guys and it seemed to me like it was all good,' then you should at least be able to say, 'Wow, what happened? I thought this was all OK.'"
Whilst Somerville may be semi-retired from poker and winning the WSOP Main Event might not be a realistic goal for a poker player to accomplish given the size of the field, Somerville is far from done with poker. "I still have poker goals," he says. "I still definitely want to earn a couple more bracelets, or win one of these big tournaments, but at this point I am focused more on different life goals. But they all sort of synergize. If Run It Up is successful, it makes it all the more sweeter when I do win a tournament down the line, there will be more people to be happy about it." But he’s aware that when you get closer to 30 years old rather than 20 that you’re almost "over the hill" in poker terms. “I’m definitely starting to feel like one of the old guys in poker, but to be honest, I feel like in the last two years in particular I’ve matured a lot. I feel like I’ve really grown into my shell, so to speak. I’ve never really felt more challenged. I’ve never felt like I was more doing what I was supposed to be doing. I’m honestly not sure where I’m heading, though, and I’m excited about that. I think I have potential avenues into different business things. I’ve developed some really cool connections into the UFC, and as a huge UFC fan I would love to connect myself into that world, to do more work with them. And then finally, and not last of which, is broadcasting, and video production, which I have a huge passion for and I really love." If you’re trying to run up a bankroll, you should watch Run It Up! I think it’s really important that you work just as hard off table as you do on table. It’s very important to review and talk poker, that’s how you really get sharp. It’s important that if you’re playing and you’re having some losses to move down in stakes. Don’t be afraid to move down in stakes, and don’t get stubborn playing higher stakes when you don’t really need to. If you’re going to play poker professionally or play poker for any kind of serious profit, I think it’s important you also have fun with it. Keep it fun because if you’re not enjoying yourself you’re going to burn out or you’re not going to want to play as much. Experiment! Play the smallest stakes available to you and see whether you prefer tournaments over cash games, or sit-n-gos, or pot-limit Omaha versus no-limit hold'em... whatever. It's good to experiment.